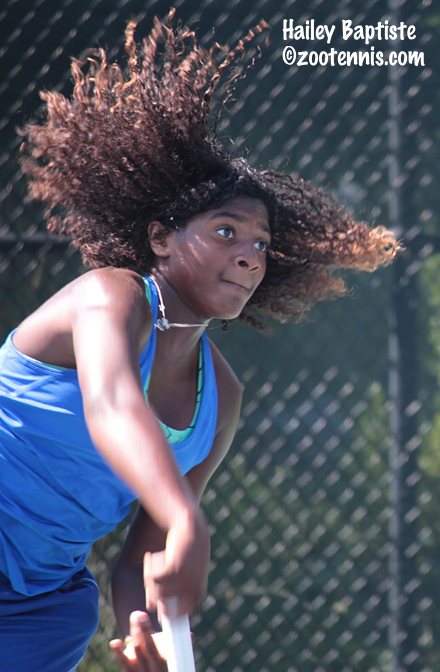 Hailey Baptiste knows and likes the fast hard courts at the Junior Tennis Champions Center, having grown up on them. That level of comfort has led to a breakout tournament this week at the Grade 1 International Hard Court Championships, with the 14-year-old reaching the quarterfinals in both singles and doubles. After defeating No. 14 seed Federica Bilardo of Italy in Tuesday's second round, Baptiste continued to impress, downing unseeded Maria Portillo Ramirez of Mexico 7-5, 6-3 in Wednesday's round of 16. Baptiste confirmed she is not interested in long rallies from the baseline. "I attack with my forehand, move my way into the net," Baptiste said. "A lot of first strikes, getting myself to move forward and put the point away at the net." Baptiste's first ITF tournament was last year's tournament here, where she lost in the opening round as a wild card. "I just came out here to have fun and I didn't expect to do anything great, because I wasn't very experienced playing international players," Baptiste said. "But the next ITFs I played, lower grades, I started doing better, getting more points and more experience and I feel over the year, I've improved my game by a lot." Baptiste's results in the two major USTA 16s events this summer--third place at the Clay Courts and fourth place in San Diego--are a testimony to that improvement. "Winning a lot of matches in a tournament gives you a lot of confidence," Baptiste said. "I had a lot of momentum coming into this tournament and I think was prepared. I knew how I was going to have to play to win matches." Baptiste's opponent in the quarterfinals is the girl who won the 16s in San Diego, unseeded Nicole Mossmer, who beat unseeded Vlada Koval of Russia 4-6, 6-4, 7-6(1) in two hours and 48 minutes. The girls bottom half of the draw features four Americans and yet another unseeded player, 16-year-old Alana Smith, who needed three hours to get by No. 11 seed Morgan Coppoc 7-6(5), 1-6, 6-4. Smith admitted she downed a Red Bull to keep her energy up, but after beating No. 6 seed Malene Helgo of Norway in the first round and 2015 USTA 16s champion Abigail Desiatnikov in the second round, she believed she would find a way to finish on top. "I went into the match with a lot of confidence, a lot more confidence," said Smith, who moved from Maryland to Florida to train with Bill Adams at the beginning of the year. "I didn't let myself get in my head. Usually I get in my head a lot and end up not closing out matches. But this is the best run I've ever had." Smith will play No. 2 seed Claire Liu, who had a bit of trouble closing out No. 16 seed Siqi Cao of China up 6-1, 5-1, but took her third straight win with by a 6-1, 6-4 score. The top half is all seeded players, with No. 1 Anastasia Potapova of Russia facing No. 10 seed Caty McNally, who beat, by 6-2, 6-1 scores, McCartney Kessler and Elysia Bolton respectively. Potapova and McNally haven't met in ITF junior play, but two years ago they played in the Eddie Herr 14s final and the Junior Orange Bowl quarterfinals, with Potapova winning both matches in three sets. The other girls quarterfinal features No. 4 seed Maria Mateas and No. 7 seed Xiyu Wang of China. Wang defeated unseeded Sabina Dadaciu 7-5, 6-4 and Mateas took out Layne Sleeth of Canada 6-4, 6-4. The boys quarterfinals feature three Americans, with No. 7 seed Sam Riffice, No. 12 seed Gianni Ross and No. 16 seed Oliver Crawford advancing with victories today. Riffice beat unseeded Alexandre Rotsaert 6-3, 6-2 and Ross defeated unseeded Nicolas Mejia of Colombia 7-5, 6-1. Ross will play top seed Genaro Olivieri of Argentina, who took out unseeded Adam Neff 6-2, 6-2. Crawford advanced with a 6-4, 4-6, 6-3 victory over No. 4 seed Alexei Popyrin of Australia, avenging a loss to Popyrin on clay at the Grade 1 in Italy back in May. Crawford likes playing big servers and the 6-foot-4 Popyrin certainly qualifies. "He played really well break point down," said Crawford. "He saved four break points in his second service game (in the third set) and three of those were aces. But I felt if I kept in it, a few more break points would come my way and it did in the 2-3 game, and I was able to consolidate. I definitely enjoy playing big servers; I feel it's more fun to return big serves and you do get a few free points when you have some lucky returns." 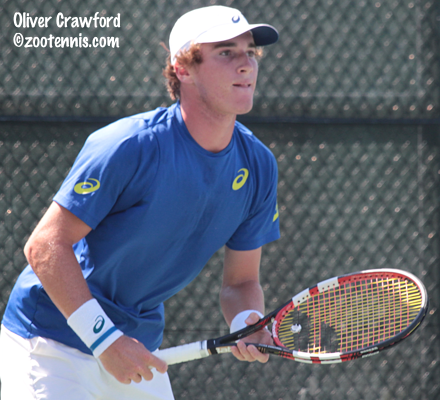 With his win, Crawford will likely receive the US Open Junior Championships wild card that is being awarded after the results from this week's tournament, as he is the only US player in the quarterfinals who is not in the main draw in New York. "I saw on your post that the best player here gets the wild card and I'm the only one who got this far, but it's not guaranteed," Crawford said. "I'm told I have a good chance of getting it, but I'm going to keep playing tennis, not to worry too much about it." Crawford recently announced he has verbally committed to Florida, although he has yet to visit the Gainesville campus. "People have said it's kind of a funny decision, but I know that Florida's the school," said the 17-year-old from South Carolina, who is a rising senior. "I really like the coaching staff. I don't think you can get a better coaching staff in college tennis, and I like the guys on the team. The location's very good, and I'll also be near Orlando. There's a lot of plusses going to Florida." Crawford's quarterfinal opponent is No. 10 seed Yshai Oliel of Israel, who defeated No. 6 seed Chien Hsun Lo of Taiwan 6-2, 6-4. Crawford and Oliel met in the final round of qualifying at this year's French Open, with Oliel winning in three sets. Riffice will play No. 3 seed Youssef Hossam of Egypt, who beat unseeded Patrick Kypson 7-5, 6-2. The fourth boys quarterfinal has No. 2 seed Miomir Kecmanovic of Serbia against No. 9 seed Khumoyun Sultonov of Uzbekistan. Kecmanovic defeated No. 14 seed Trent Bryde 6-2, 7-6(4) and Sultonov outlasted No. 8 seed Juan Carolos Aguilar of Bolivia 4-6, 6-1, 6-2. Sultonov beat Kecmanovic at the Grade 1 in Roehampton earlier this summer. In doubles, Baptiste ended her banner day by teaming with Lea Ma to beat top seeds Potapova and Koval 7-6(1), 7-5. Only three seeded teams remain in the girls quarterfinals, with No. 4 seeds McNally and Natasha Subhash the highest seeds left. No. 2 boys seeds Olivieri and Aguilar also were eliminated, losing to Oliel and Andrew Fenty 6-3, 6-1. Complete results and Thursday's order of play can be found at the tournament web page. The first round of men's and women's US Open qualifying was completed today, with 12 US players joining the nine that advanced with wins on Tuesday. Usue Arconada, who received a last-minute wild card, earned her first slam victory with a 3-6, 6-3, 6-3 decision over Ya-Hsuan Lee of Taiwan. Another 17-year-old, CiCi Bellis, advanced with a 6-0, 6-2 win over Lina Gjorcheska of Macedonia. 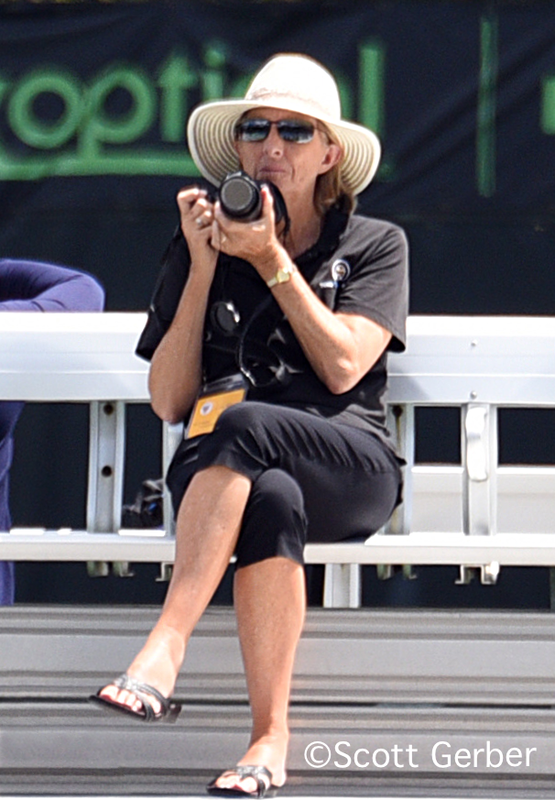 Grace Min beat Julia Boserup 6-4, 6-2; Taylor Townsend downed Elizaveta Kulichkova of Russia 6-4, 6-4; Jennifer Brady overcame Anastasia Pivovarova of Russia 1-6, 6-3, 7-6(5) and Melanie Oudin beat Caroline Dolehide 6-4, 6-3 in an all-US wild card battle. 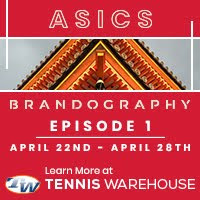 US men who advanced to the second round included four wild cards: Ryan Shane, a 2-6, 6-4, 6-1 winner over Kimmer Coppejans of Belgium; Reilly Opelka, who beat Edouard Roger-Vasselin of France 3-6, 6-4, 6-3; Sekou Bangoura, who defeated Gonzalo Lama of Chile 6-2, 6-1 and Christian Harrison who got by Luke Saville of Australia 4-6, 6-0, 7-5. Noah Rubin won when Yan Bai of China retired trailing 3-0, and Jared Donaldson advanced with a 6-3, 6-4 win over Eduardo Struvay of Colombia. All 21 Americans will play their second round matches on Thursday. The men's draw is here, the women's draw is here.